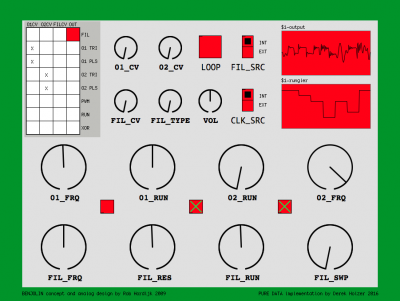 The Benjolin is a standalone synthesizer designed by Rob Hordijk from the Netherlands in 2009 and available as an open hardware project online. This Pure Data implementation of the Benjolin was coded by Derek Holzer in SEP-NOV 2016 in Helsinki, after several years of producing customized hardware Benjolins from his Berlin studio. This entry was posted	on Monday, December 5th, 2016 at 18:46	and is filed under Announcement. You can follow any responses to this entry through the RSS 2.0 feed. Both comments and pings are currently closed. Powered by WordPress v 5.0.2. Page in 0.438 seconds.